C:\Program Files (x86)\Microsoft BizTalk Server 2010\Tracking>bm deploy-all -Def initionFile:"C:\program files (x86)\Microsoft BizTalk esb toolkit 2.1\bam\micros oft.biztalk.esb.bam.exceptions.xml" Microsoft (R) Business Activity Monitoring Utility Version 3.9.469.0 Copyright (C) Microsoft Corporation. All rights reserved. 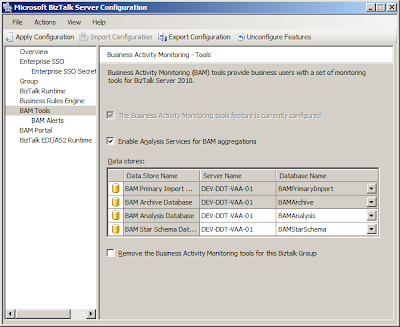 Using 'BAMPrimaryImport' BAM Primary Import database on server 'FOO-BAR'. .. Deploying Activity... Done. Deploying View... ERROR: The BAM deployment failed. The BAM Star Schema database has not been configured. Run bm.exe setup-databases to configure the database. Bm.exe deploy-all -DefinitionFile:"C:\Program Files (x86)\Microsoft BizTalk ESB Toolkit 2.1\Bam\Microsoft.BizTalk.ESB.BAM.Itinerary.xml"
Bm.exe deploy-all -DefinitionFile:"C:\Program Files (x86)\Microsoft BizTalk ESB Toolkit 2.1\Bam\Microsoft.BizTalk.ESB.BAM.Exception.xml"
If you got the above error, it was probably likely to do with the fact you didn't check the Enable Analysis Services for BAM aggregations checkbox during configuration of BizTalk after setup. When you check that checkbox, two more databases will appear in the Database Name list; BAMAnalysis and BAMStarSchema. Clicking Apply Configuration creates those missing databases ready for the activity import later. Using 'BAMPrimaryImport' BAM Primary Import database on server 'FOO-BAR'.